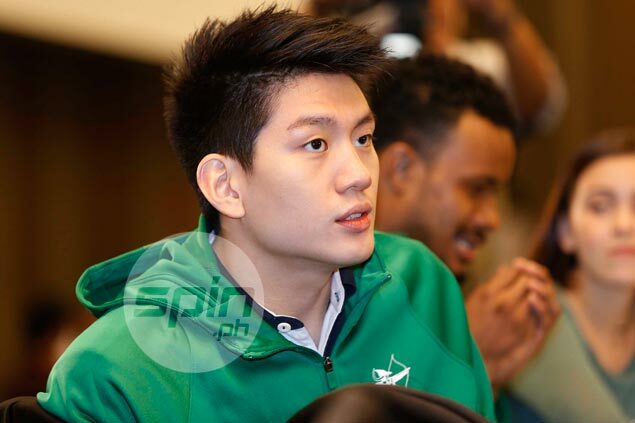 JERON Teng was formally picked number one by AMA Online Education during Tuesday’s PBA D-League draft held at the PBA Cafe in Pasig City. Teng was selected as the top overall pick following his La Salle team's championship run in UAAP Season 79 where he also won Finals MVP after the sweep over Ateneo in the title series earlier this month. The former La Salle star begins the transition to the pro ranks with his debut in the PBA D-League. Players who want to play in the PBA, with exception of those who already joined the national team, are required to suit up in the developmental league. Teng is expected to beef up the AMA squad that got only as far as the first round of the playoffs in last year’s campaign. Jom Sollano of Letran was selected second overall by Tanduay while Jon Gabriel of Colegio De San Lorenzo was picked third by Racal. Being a school-based team, CafeFrance pre-selected Patrick Aquino of Centro Escolar University at No. 4, while GBoy Babilonia of Ateneo was chosen by Wangs at No. 5. School-based teams chose their own players with Victoria Sports-Manuel L. Quezon University picking Jayson Grimaldo at No. 6, and Cignal-San Beda taking Davon Potts at No. 7. Wilmar Anderson of University of Batangas was picked No. 8 by Batangas to cap off the first round of the draft. Surprisingly, Fil-Canadian point guard Jason Brickman, a Finals MVP in the Asean Basketball League and one of the top prospects of the draft, was chosen in the fourth round by Tanduay.